In this PLACEMENT EXPERT ADVISE section we are presenting an Interview of SAURABH WALIA on the basis of our talk with him. Hope this interview will help the student’s to prepare them for the placement. 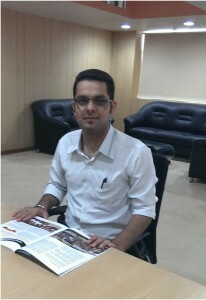 SAURABH WALIA at present is the HEAD- Training & Placement Department At ACCURATE INSTITUTE OF MANAGEMENT AND TECHNOLOGY. He had working Experience of around 7 years in this field. He has also worked in organisation Like Cognizant, Ministry of Health and Family Welfare. He also runs his own training company named SMS Training. UPTU Khabar Editor: What is the skill’s a college student need to face the interview? Saurabh Walia: A fresher should must had good communication skill, presentation skill I.e. how to present himself in front of interviewer and had interview handling skill. UPTU Khabar Editor: According to you what qualities did a fresher lack’s due to which he Fail’s to crack the interview or not survive in the corporate world? SAURABH WALIA: In today scenario what I had seen in the student is that they do not have good domain knowledge (i.e. subject taught in 2nd & 3rd yr) in which they are studying. They forget those subjects or had no deep knowledge. Also they do not have dedication and discipline. And they had no clear goal that where they had to go. UPTU Khabar Editor: Sir according to you how can a student during these 4year’s of B.tech can transform himself from student to industry ready? SAURABH WALIA: In the very first year they should connect them self to T&P dept of their respective college to get important guideline and evaluation. In first year they should focus to strengthen their Aptitude and reasoning skill. In 2nd & 3rd year they should focus on to gain the deep domain knowledge because it will help them in future. In 3rd yr they should go for internship as it will help them to know an insight of industry. Also from 3rd yr they should work on a LIVE PROJECT related to there domain. In final year they should start learning about Interview Handling skill, Resume Writing and also can do Value Added Course based on industry demand. Example Today In PHP there are around 20 million job opening but student don’t prefer to do course in this technology because it is not it there syllabus. UPTU Khabar Editor: Sir says something about online hiring technique? SAURABH WALIA: Online Hiring technique is a new trend in the industry.There is an increase in 20%-23% in this. It is also a very effective technique because Student doesn’t need to go from conventional process and it also help industry to get the right talent. Student should make their profile on social networking site’s like LINKEDIN and FACEBOOK.Also there profile should be relevant because company shortlist them on this basis. Also Companies like TCS, Cognizant, and IBM offer online technical training and quiz so student should actively take part in this. UPTUKHABAR EDITOR: Sir we had listened about the ups and down’s in the market.How it is going to effect the placement of student? SAURABH WALIA: Due to downfall in the GLOBAL Market worldwide this thing’s are happening. But still companies are hiring the people but there is a change in hiring trend. Now companies have stopped the PRE-HIRING and BULK HIRING. They had made a strategy of hiring “RIGHT TALENT AT THE RIGHT TIME”. Also companies are cutting the training cost and prefer to get industry ready guys. So if you have the right talent you don’t need to worry you will get your place in the industry. UPTU KHABAR EDITOR: Sir What rating you will give to uptukhabar. SAURABH WALIA: UPTU Khabar is doing very good work for student.They are proving one stop solution for student. I appreciate the initiative of UPTU Khabar for the welfare of student. I wish them all the best. And my rating for UPTU Khabar is 9/10. Thank you sir for sharing your view’s with us.